In January of 2014, the Sonoma County Winegrowers put a stake in the ground with a bold commitment to become America’s first 100% sustainable wine region by 2019. Sonoma County has a heritage of farming families preserving their land for the next generation. It is part of the very fabric that defines Sonoma County as an agricultural community and wine region. These values are delivered in every wine bottle that proudly carries the Sonoma County designation. Sonoma County’s grape growers and winemakers have long been at the forefront of creating and utilizing sustainable practices in their vineyards, in their wineries, and their business operations. 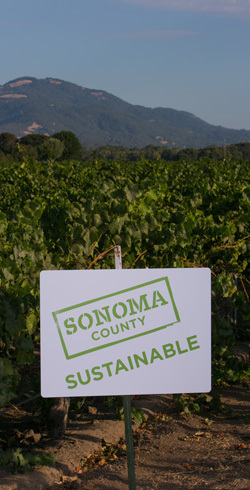 As you drive around Sonoma County, make sure to watch for our “Sonoma County Sustainable” vineyard signs that identify the vineyards that are practicing sustainable farming. Sonoma County Winegrowers take a triple-bottom line approach to sustainable practices that measures a grape growers’ commitment to being socially responsible in how they treat their employees, neighbors, and community, environmentally conscientious with their farming and winery practices, and economically viable as a business. We also require third party certification with an emphasis on continuous improvement. Since putting this stake in the ground just over 5 years ago, Sonoma County’s grape growers and vintners have made incredible progress towards reaching this goal. As of December of 2018, more than 97% of our vineyard acreage have gone through a sustainability self-assessment and over 87% of our vineyard acres have been certified by a third-party auditor. These groundbreaking efforts have received global recognition, including California’s Governor Brown bestowing the state’s highest environmental honor, the 2016 Governor’s Environmental and Economic Leadership Award (GEELA), to Sonoma County Winegrowers for their leadership and commitment to sustainability. Visit www.sonomawinegrape.org to learn more.